Recovery starts with a phone call. You can change your life by calling at any time. 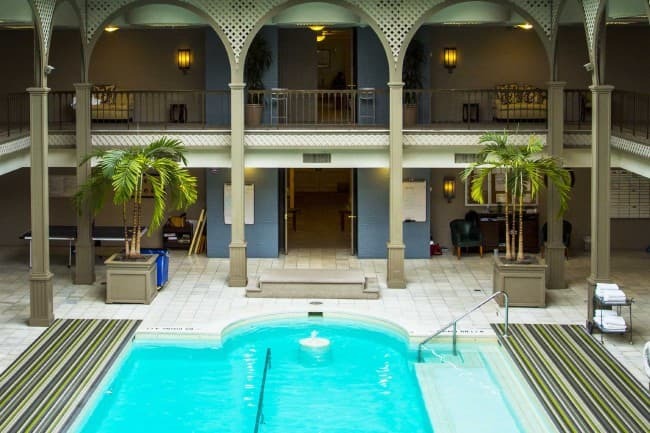 Greenhouse Treatment Center prides itself on its luxurious setting and high-end amenities, offered to all residential patients who come to start their path to recovery. Located in a former luxury spa, Greenhouse provides its patients with indoor and outdoor pools, a fully-stocked fitness center with a proctored wellness program, and three meals a day crafted by an expert executive chef. Greenhouse features hotel-style rooms with two full-size beds in each room. For those who want a little more privacy, single rooms are available. Please ask about availability, as these rooms are limited. Our rooms feature private closets, roomy bathrooms with walk-in showers, a vanity area, and many windows to bring in lots of light. Indoor/outdoor heated pool and jacuzzi. Fit in a workout, out or simply relax in our luxurious, spa-style pools and jacuzzi. Lounge areas: During the hours you aren’t in groups or classes, you can relax and spend time with others in our cozy lounge areas where you’ll find TV, board games, and books for your enjoyment. Library. Find reading materials and a quiet place to relax during your downtime. Executive chef. Poor nutrition is a common consequence of substance use and is associated with numerous health risks. Our executive chef (former executive chef of the Neiman Marcus spa) serves delicious and balanced meals that you’ll enjoy eating and that will help to address any nutritional deficiencies. All meals are served in a communal area surrounding our indoor pool. Our nutritionist can work with you to help create a plan for you to begin eating better and feeling better. Massage and acupressure to aid your recovery. You may schedule appointments at an additional cost. Biosound therapy. This holistic therapy which involves the use of a vibrational platform constructed of memory foam combines guided imagery, sound healing massage, biofeedback, and music to soothe the patient and elicit a sense of deep relaxation. Patients also learn coping skills during the process as they lie quiet and still. Because biosound therapy can bring about a sense of peace and calm and decrease anxiety, it can reduce the risk of patients leaving against medical advice. Fitness center. Years spent in active addiction often leads to poor physical health. In our fitness center, you can regain your physical strength, gain confidence, and feel better overall. Holistic and recreational therapies. Build coping skills, learn healthy habits, and improve your overall wellness with classes such as yoga, Pilates, tai chi, and meditation/mindfulness. Walking path and 12-step walk. Snack bar. When you’re in the mood for something sweet, you can visit our snack bar to select from an array of treats, which can help with certain drug cravings. Outdoor medication area with water features. Our caring Admissions Navigators are available to discuss your options with you 24/7.